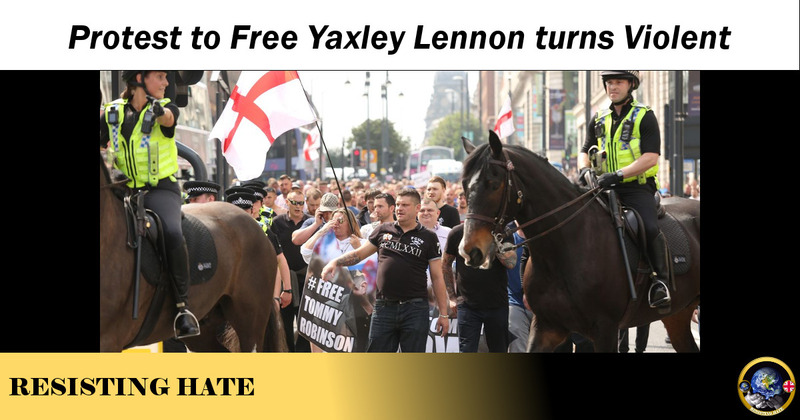 The protest to free convicted fraudster convicted fraudster Stephen Yaxley-Lennon got underway in London today. 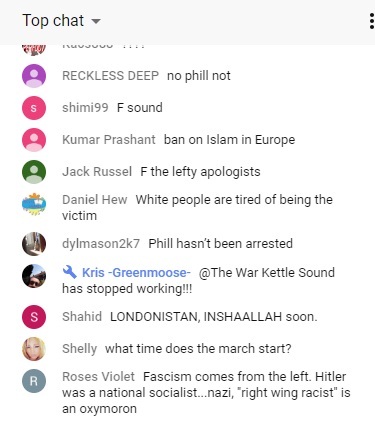 By 4pm the march had already turned violent as reported by the Evening Standard earlier today. The so called peace protest involved smoke bombs being thrown at police officers. Thugs clashed with police and charged at riot cops. Five pro Tommy yobs have now been arrested. 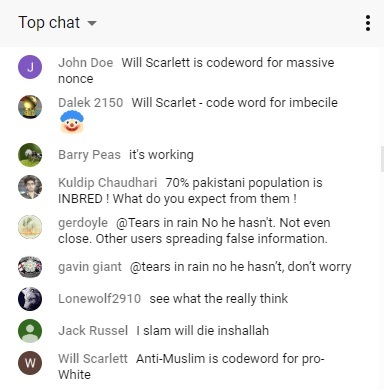 The protest was live streamed by various different You Tube channels and I logged on to see what kind of comments were being left. White kids? Why not a future for all kids you racist scumbag hiding behind a fake account? And Hitler wasn’t a socialist. 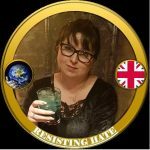 Read Halal Kitty’s article and educate yourselves. 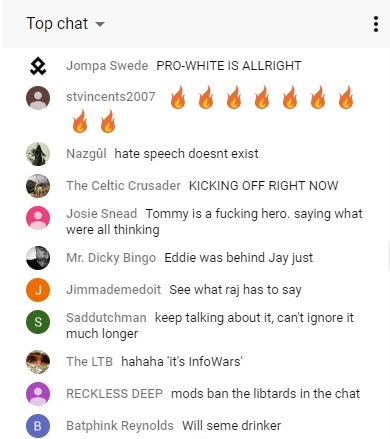 You can see the point I spot the chat, lol. And here the irony. 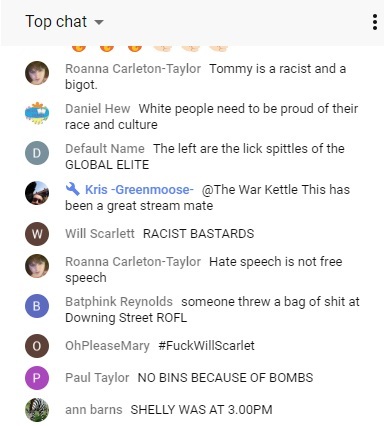 Crying about Tommy imprisoned for ‘free speech’ but having the hypocrisy to ask for speech to be censored in the chat. Talk about an own goal! There is a serious point to be made here. 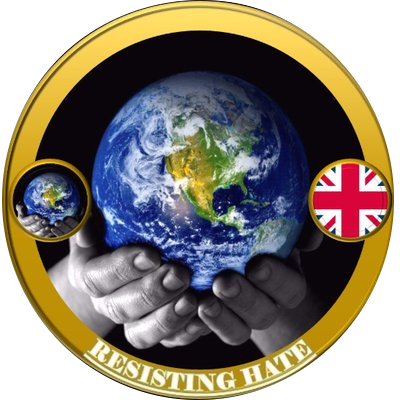 The imprisoning of convicted fraudster Stephen Yaxley-Lennon is being touted as the defence of free speech which is helping the far right reach a wider audience and to an extent legitimise their agenda of hate behind the veneer of faux equality. Robinson was not imprisoned bcause of his views or the fact that he spoke his mind, he was imprisoned because he broke the law. 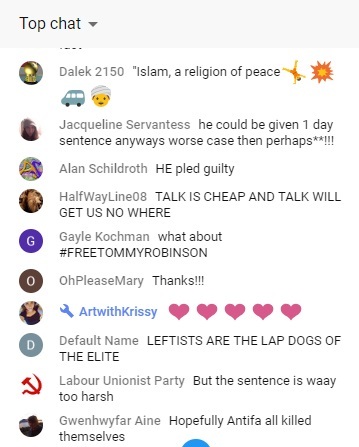 It doesn’t matter how many lager soaked bigots and yobs cry on the streets about it, Robinson knowingly broke the law and pleaded guilty in court to doing so. Idolising Robinson and seeing him as a hero of the masses and a voice of free speech is grossly misrepresenting the facts. Under UK law you have the right to your own beliefs, views and opinions. You have the right to express them. Nobody is trying to take that away from you. But you do not have the right to abuse and harass others. 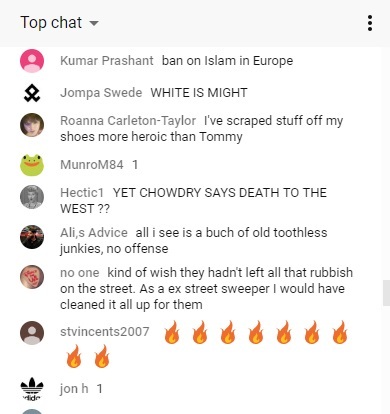 And frankly, if you want to, you belong in jail with your beloved Tommy.